So Im messing around with a project at my local volunteer station. We have been approved for a new vhf frequency. We need to take the Audio and COR from Harris XG75P and link it to a VHF CDM1250 Radio. 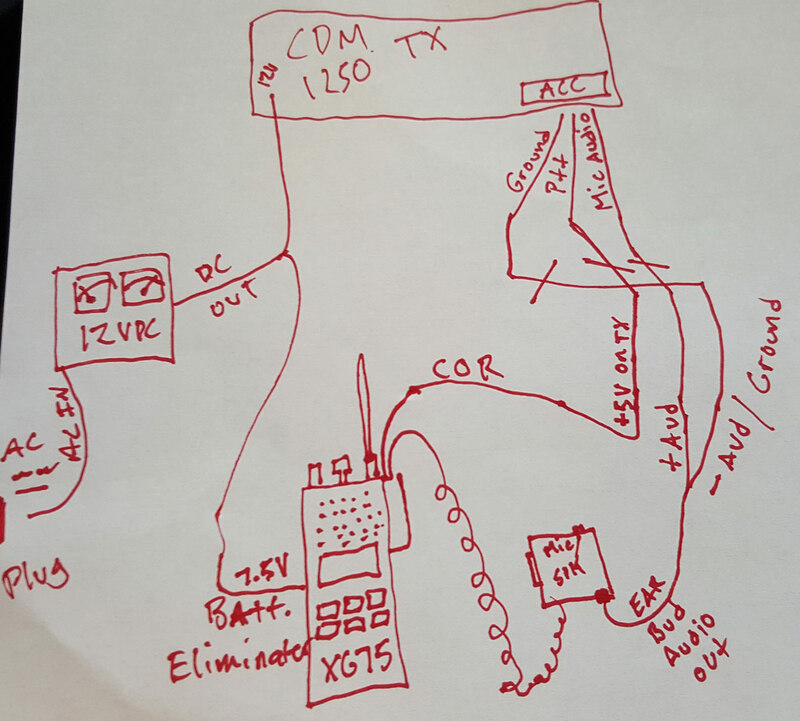 Basically we are trying to build a 1-way crossband repeater from 700MHZ Trunked TAC1 to our Licensed VHF Frequency to broadcast to our members multi-channel voice pagers. ► +5V COR when voice traffic is received, 0 - 0.2 volts dc when no voice is present. What am I doing wrong (Other then using a Harris Radio)? I am using what we have available to keep down on cost. Once I figure all this out I want to have a cable professionally made to use. Thanks for your input guys and gals. John Higham gives us some useful information here at http://jhigham.blogspot.com/2012/07/mot ... -tm-1.html , and your statement of ► Carrier Receive TX Input (COR) gives us some more. What I _think_ is happening is that you have the COR/Carrier Detect from the XG75 (pin that goes hot when the radio is unsquelched and receiving) connected to the same pin on the CDM1250! Instead, you need to connect that to a PTT input configured for active-high. 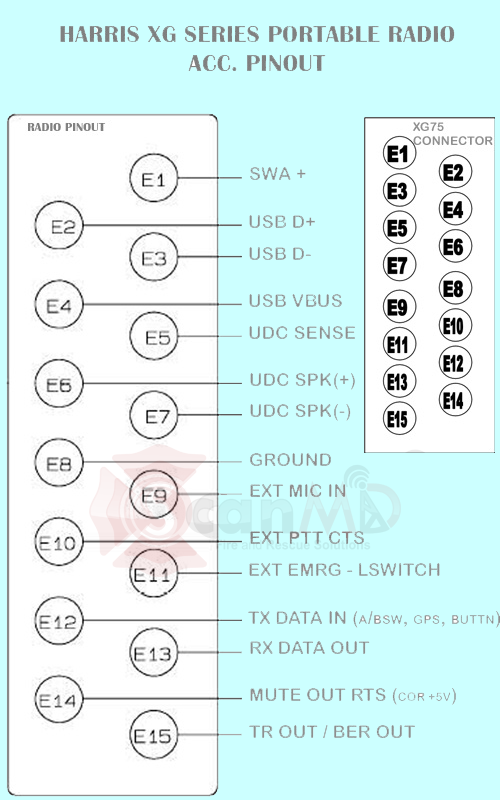 suggest Pin #3, that's normally PTT already (to maintain compatibility with the GM300 radios, IIRC). To look at it a different way, you don't want Carrier Recieve - that's not an input, that's an output. Make it PTT, Active High. Debounce is maybe, maybe not. You and your dept chief both do understand that ANY SIGNAL appearing on your 700 MHz TAC1 will be transmitted on the HB channel, even if there is an emergency conversation already in progress? I doubt that operation will pass muster with your state SCIP; I know it would be rejected by the APCO committees in most Regions. I would take the +5 and input that into an npn transistor with a 1k resistor. That will give you an active low signal that you can feed into the CDM. Karl NVW wrote: You and your dept chief both do understand that ANY SIGNAL appearing on your 700 MHz TAC1 will be transmitted on the HB channel, even if there is an emergency conversation already in progress? I doubt that operation will pass muster with your state SCIP; I know it would be rejected by the APCO committees in most Regions. OP didn't ask about SCIPs or APCO committees. Sounds like they're patching their 700mhz trunk system to a newly licensed VHF channel. Since most MInitor pagers can handle two freqs, sounds like CH1 is their paging channel and CH2 is the patch so they can monitor the trunk channel without having to all carry portables. Regardless of what OP is doing, this isn't RadioReference and the rules and regs don't need to be quoted here. Sorry for stomping on toes, it won't happen again. I didn't realize that content of the FCC rules was board-dependent.